Top-Rated SellerAlicesLookingGlass consistently earns high ratings from buyers thanks to fast shipping and excellent service. This item is 1 oz. 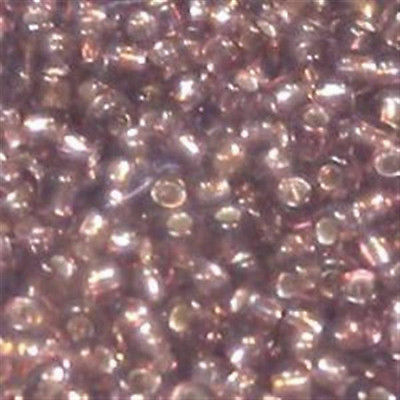 or 1100 approximately 2mm x 2.75mm Size 8/0 Transparent Lilac Silver Lined Glass Seed Beads. These are great little beads, very versatile. Any questions just ask. Keep Shopping! Take advantage of our shipping discount! .25 each additional item. When this amount reaches 6.00, your order is upgraded to Priority Mail! Free USPS Shipping (service of our choice) on all U.S. Orders 40 or more International orders of 200 or more! Above rate is for First Class Mail within the U.S. only. Combined Shipping Rates are available for International Buyers as well. Many More Jewelry Making Supplies Coming Soon from Alice's Looking Glass Jewelry!!! Check out my other items! Thank You For Looking! Payment and Shipping Information Paypal, Credit Debit Cards accepted. Combined shipping available and requires payment be made in one lump sum. See 1st Class Mail rates above or use shipping calculator if displayed. Priority Mail (within U.S. only) = 6.00 for all orders (unless otherwise noted within item description) and usually arrives in 2-3 days after leaving our facility, but not guaranteed. Express Mail (within U.S. only) is guaranteed delivered Next Day or 2nd day to most U.S. locations 365 days a year and includes insurance up to 100.00 value, CHARGE varies by weight. Payment is expected within 10 days. INTERNATIONAL SHIPPING: Import duties, taxes and charges are not included in the item price or shipping charges. These charges are the buyer’s responsibility. Please check with your country’s customs office to determine what these additional costs will be prior to price or mark items as gifts as US and International government regulations prohibit doing so. Thank you for stopping by Alice's Looking Glass Jewelry! WHEN BUYING ITEMS WITH DIFFERENT S H CHARGES, THE HIGHEST S H CHARGE COUNTS FIRST. These are GLASS BEADS. Froo www.froo.com Froo Cross Sell, Free Cross Sell, Cross promote, Marketing, listing Apps, Apps, Application When buying one item, please use the "Buy It Now" button, if building an order please use the Shopping Cart to get our best Combined Shipping Rates. Combined shipping requires combined payment. When paying for multiple items, buyers must pay in one lump sum to receive discounted shipping fees. If your invoice looks wrong to you or you are unsure, PLEASE request an invoice and we will manually correct it for you.